Campbellian science fiction, especially hard science fiction, gets a hard time in the quarters I run in. Epic fantasy is denigrated in favor of slim sword and sorcery paperbacks. I like a good pulpy adventure as much as the next guy, but I refuse to give up on my original love, epic fantasy, or my more recent discovery, hard science fiction. Detailed worldbuilding (for the former) and limits of the science (for the latter) can, in the hands of a skilled and careful storyteller, be a wonderful tool for creating and enhancing narrative tension. Heinlein does this masterfully with the space suit in Have Space Suit—Will Travel. Why do I mention this in a review about a zombie book? Because I’ve been saying for years that zombie fiction should focus more on the difficulty of survival itself, turning a zombie yarn into as much survival fiction as horror. That view is totally vindicated by A Place Outside the Wild, a zombie apocalypse book that uses such a focus to great effect. The smart move on Humphreys’ part is that, after that initial introduction, the story leaps forward eight years. And, for all that the zombies initially look very familiar, eight years down the line things start to get weird. 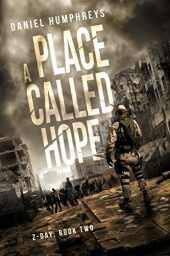 Humphreys released the sequel, A Place Called Hope, last month and I will post a review in a couple of weeks. You wouldn’t think there would be much left to worry about eight years in. “No matter how infernal the engine behind its reanimation, at some point [human flesh] gives out.” And if you’re going to starve to death, you probably would have done it before year eight. Miles is living with a community of survivors on his uncle’s farm. Fences keep them safe from zombies, and with the help of biodiesel they have managed to keep enough heavy farm equipment running to lift themselves a notch above bare subsistence farming. That and scavenging runs have led to a rudimentary market. Of course the first business is a bar. Hey, this is Indiana. They had plenty of pain to numb before the zombie apocalypse. More disconcerting, someone in the community is cooking meth. Miles is the sheriff (there is a limited demand for IT guys post-apocalypse) and his job gets much busier when he has to investigate not just the meth ring but also a murder. On top of that, the community is about to make its first contact with the outside world in years, and the zombies are starting to act in ways that zombies are not supposed to act. It is a good setup, if not an extraordinarily inventive one. Humphreys shows craft in balancing his storylines. But the real craft is in his attention to detail. He takes great care with the details of guns, farming, and scavenging—all of it in service of cranking up the narrative tension. The big external threats are compounded by internal complications from everyone from ne’er-do-wells cooking meth, to community politicians who in our world would be turning an HOA into their private fiefdom, to the shirkers who show up in every commune. Miles isn’t Rambo so much as the sort of person who, when faced with hardship, reacts by shrugging and saying, “I have to.” (Which is really more farmer than IT guy, to be honest.) Miles is the main focus, but Humphreys uses several different POVs, giving us several heroes to root for. They face enough threats—internal and external—to keep themselves busy. 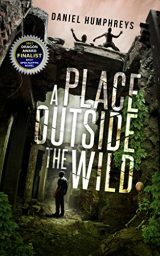 A Place Outside the Wild was a finalist for a Dragon Award last year, and deservedly so. I could say a lot more, because Humphreys does some really interesting things with the canon, but I don’t want to spoil anything. This is a story that features ordinary men and women acting heroically, some killer action scenes, and a great twist on zombies and the trigger for the apocalypse. It’s a story that takes its subject matter very seriously in a way that makes it a much better story. And it is a story about facing adversity with perseverance and hope. Did I mention the title of the sequel? Disclosure: Humphreys sent me a review copy of A Place Outside the Wild. This review of A Place Outside of the Wild was originally published at the Castalia House Blog. This entry was posted in Book Reviews, Dystopian/Apocalyptic, Horror and tagged Indie Books, Post-Apocalyptic, Zombie Fiction. Bookmark the permalink. Kind words from HP at Every Day Should Be Tuesday . . .